So you didn’t want to brave the “snow” that was expected and didn’t make it out last night? Well you missed a good event. 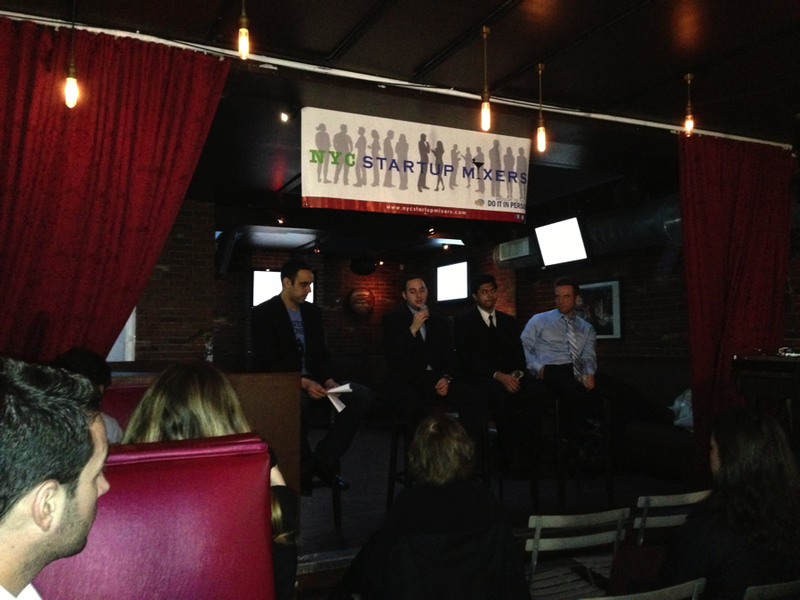 Haithem Elembaby and the team at StartupMixers held their first speaker series event entitled “Disrupting the Undisrupted”. The theme of this speaker series is to highlight how entrepreneurs are innovating in areas that are often not thought of as cutting edge technology. The evening’s panelists consisted of the team from Vengo, formerly known as Taxi Treats. Vengo is a New York City based startup that has developed a high-tech vending machine that is currently used in bars, hotels and office buildings. Their version is the 21st century’s answers to the traditional vending machine (seen below) and carries an assortment of products that one may need quickly while on the go, including Sour Patch Kids (the company’s best-selling product), hand sanitizer, chewing gum, prophylactics, etc. The company recently raised $1 million in funding from some notable investors, including Joanne Wilson, Brad Feld, and David Tisch. 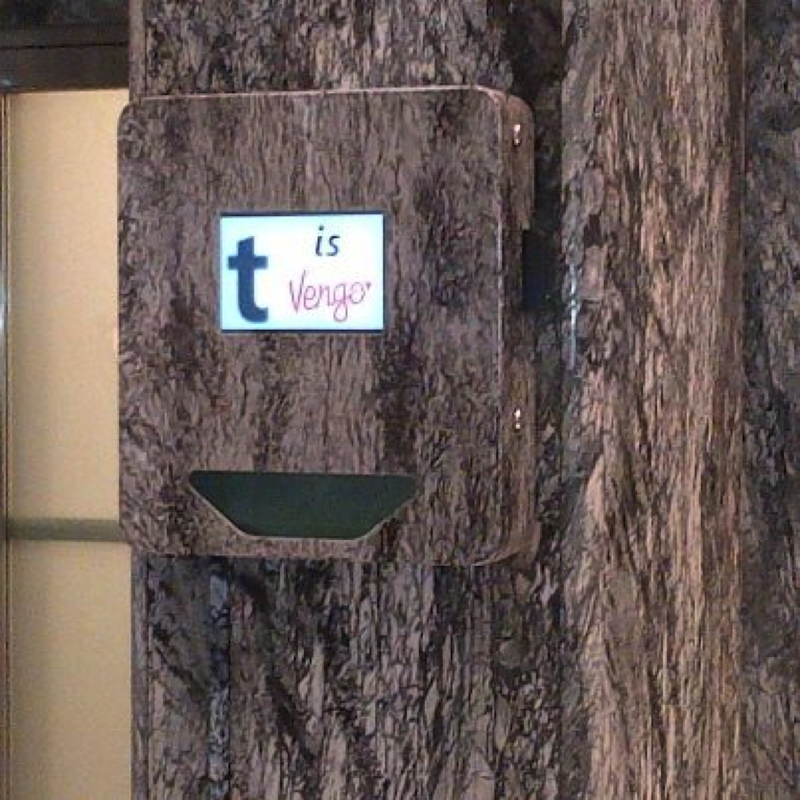 Mayor Bloomberg has also recently mentioned Vengo in his blog. The first iteration of the concept started late 2011 when founder and CEO Brian Shimmerlik began noticing the popularity of “Taxi TV” in just one of the 680,000 cabs rides that are taken in Manhattan alone daily. An idea was born to take advantage of this unique opportunity, where you have a semi-captivated audience in a yellow cab. Brian tirelessly began reaching out to heads of fleet services about the possibility of implementing a point of sale vending device in one of their cabs. He was met with mixed reactions and advised to get a “government champion” to support the plan. Just doing that, in March of 2012, the company was named winners of the City of New York’s “NYC Next Idea 2012″ Contest amongst a field of 270 companies, and received a grant for $17,500. The company was able to leverage this funding to create a prototype – the first vending machine of its kind that was completely cashless. A month after receiving the funding, the team took a meeting with the head of the TLC. Off the hubris of winning the contest, they expected the TLC to be receptive to adopting their hot new technology and becoming their “government champion”. They quickly realized that getting into the taxi market in NYC might not be their best option at the onset. The pivot consisted of looking towards other distributions points for the vending display, including bars, hotels, and office buildings. Thus, the company could avoid the nuances of putting a high tech vending machine in a bumpy cab. These alternative forms of distribution also enabled the company to go out and build some immediate traction without having to wait for the red tape in working with the TLC. As Vengo is a hardware business that drives software, there are a unique set of challenges. Hardware is capital intensive and entry costs are quite high. It is also difficult to scale, from a cost perspective; achieving economies of scale will require a large number of units. Lastly, software can be changed on the fly, but hardware cannot. However, the team has been able to leverage their aerospace background and this has influenced the design of the product to best combat some of these costs and concerns. The company now sits at the intersection of consumers, bars, and brands and is wisely positioning itself as a point of purchase digital partner. Vengo is currently in the midst of a 10-unit pilot program, with machines scattered across various venues in the city, and plans on implementing a modified version of the vending machines in taxis in some shape or form, or perhaps even consider a market outside of New York. Vengo has built out a multi-tiered model, with product sales as the primary revenue driver. The company has also built in advertising and sponsorship opportuities and has future plans to provide data analytics for brands. Chief Design Officer and Co-Founder Steven Bofill stated that the company is looking at ways to make the devices lighter and smaller to encourage adoption. Currently, the units weigh 25lbs and hold up to 130 products. It is great to see a company like Vengo attacking something new and completely different, outside the realm of the typical startup idea that have become so commonplace whose models are “we are the Warby Parker of _________” or “the “Etsy of _______”. The first event in this series from Startup Mixers has shown a lot of promise and I look forward to the next event in the “Disrupting the Undisrupted” series to learn more about more startups that are not built on a “me too” model. The next event will be some time in May. Be sure to check the AlleyWatch calendar for the details when they are announced. For full coverage of startup events in New York, visit The Watch.